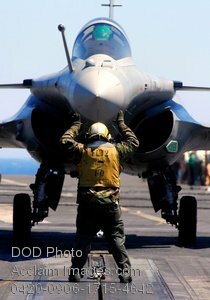 Description: MEDITERRANEAN SEA (May 21, 2008) A plane director assigned to Air Department's V-1 division guides a French Navy Rafale jet to one of the catapults on the flight deck aboard the USS Harry S. Truman (CVN 75). U.S. Navy photo by Mass Communication Specialist 3rd Class Ricardo J. Reyes. Stock photography by Department of Defense Public Domain.